MaCC Has A New Look! More Controls, More Features, More Options, Sleaker Design and Still Easy To Use! Weight Loss Support Groups Are Back! Support groups provide a competitive and supportive atmosphere allowing you to help keep each other motivated, on track, accountable and losing weight! are easily integrated into your forum signature, blog or website. Visit our Weight Loss Ticker Library to get started, no account needed, 100% Free! Free Calorie Counter and Weight Loss Tools! Much more than a simple free calorie counter to help track calories and exercises! And Many Additional Weight Loss Tools! Free Calorie Counting = Weight Loss! We supply all these tools for free, if you like our services all we ask is for a link back to this site. Losing weight the healthy way is not easy, takes time with lots of dedication. Information is the key to any battle! Our Free Calorie Counter and Diet Weight Loss systems will provide the information to win your weight loss battle. By keeping a record of your calories and exercises, you will have the tools to help keep you on track, motivated, healthy and losing weight. Newest Free Calorie Counter Members! With Free Calorie Counting tools such as our Food Pantry and Quick Tag Search System, you can get in, get out, and on with your life. 3,500 Calories = 1 Pound, Losing weight has never been simpler! Your Food Journal will keep track of your total nutrient intake, showing you what your daily nutrient intake currently is and if you have gone over your nutrient targets. A Daily Calorie Limit is also available to help keep count of your caloric intake. Your Exercise Log will track and tally up your Total Daily Energy Expenditure based on your current daily activity level. Or you can add exercises yourself from our extensive exercise library or make up your own! Our weight loss forums are a great place to support and encourage one another. This is also a great place to get site updates, suggest new features or get technical help using our site. Stop in and say hi! Everyone one starts out with a default weight loss ticker. You can customize the weight loss ticker in several different styles. 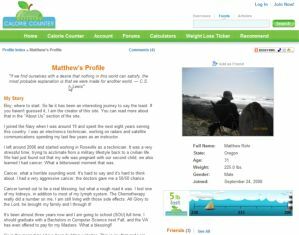 Code is also available so you can display your weight loss ticker in your forum signatures, blogs or personal web pages. You don’t have to be a member to build a weight loss ticker! Weight Loss Tickers are free and available to the public. Support Groups are specially tailored for those such as couples, co workers, and family members that share the same exercise routines or eat the same foods. Support Groups allow for members to share each other’s personal food and exercise libraries. So if you and your spouse are in a support group, only one of you has to enter a food into your personal food library and you both will have access to that food. 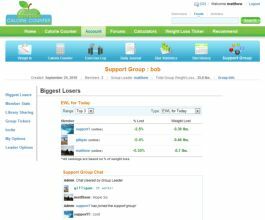 Support Groups also keep track of everyone’s EWL per day and over all weight loss, in addition each of your total calorie intake and total calorie burned will be displayed in Biggest Loser leader boards. Everyone also has access to each other’s weight loss ticker. Take a break from Calorie Counting and visit the Article Section. From Fitness to Nutrition, Weight Loss to Women’s Health, our articles will help you stay on track, motivated and losing weight! View our available articles in our Article Index. Comprehensive weight loss information, specially tailored to your diet that will allow you to see where you are in your current daily and overall weight loss goals. We can calculate a daily Estimated Weight Loss (EWL) based on your BMR, BMI, Total Daily Calorie Intake and Total Daily Calories Burned. We can also calculate your EWL since your last weigh in. Everyone starts out with a simple food library. You can start adding foods to build your Personal Food Library that best fits your lifestyle. Create your own Exercise Library, personally suited to your regular daily activities. Add exercises manually or use our exercise calculator that list dozens of common exercises. Your Personal Exercise Library works a lot like your Personal Food Library. All this for FREE! Why? You can read my story here. If you are ready to take the leap, ready for a fresh start, ready to take that first step or just continuing your weight loss journal, there is no better time, so Join Now! Matthews Calorie Counter now has a Blog! We are moving these Beta Updates to our Official Blog. 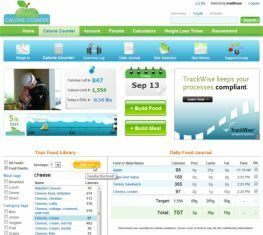 Having a blog will allow us to share more information about new free calories counter features, changes and allow more interaction with the our Free Caloric Counter community. Having a blog will also allow us to feature different aspects of our free calorie counting services and additional weight loss tools that you may not know about. So please drop by, leave a comment, suggestion, question or just to say hi!